I thought that I had finally reached the point that my hunger had subsided, but it came back this week with a vengeance. 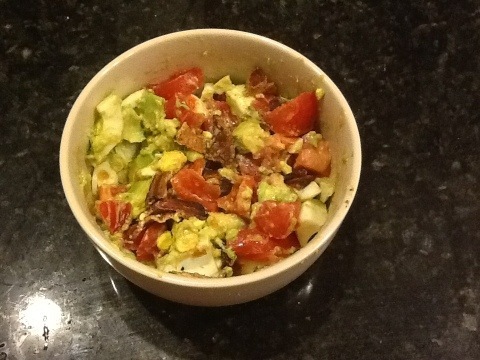 Dora had requested hard boiled eggs, so I decided to try the tempting Bacon, Egg, Avocado & Tomato Salad that Jewel pointed out to me. I didn’t think I could eat a whole avocado for breakfast, so I used half. I also used lime juice instead of lemon. This held me over for 5 hours, which is unprecedented for me. Even with using only half the avocado, I could barely finish it. If I can find another good tomato again this winter, I will make it again soon. I also think this would be good as a lunch stuffed into Romaine leaves. 13. I am drinking less often, and not because it’s discouraged on the Primal diet. Most nights I just haven’t felt like it. I think that I feel less stressed since limiting screen time and giving up multi-tasking. Since I am making sleep a priority I’ll sign out for now! 2 Responses to Can’t BEAT This Breakfast! Looks fantastic, and glad that sleep is a priority. You need it to heal the back and deal with your hectic work schedule.